Imagine sitting in the morning sunshine eating nectarine jam on warm croissants Theresa Storey of The Green Apron celebrates four seasons of fruit with recipes for sweet favourites like cherry pie and strawberry jam, as well as savoury dishes such as sole Véronique and lamb and fig tagine. She also includes a few surprises, like blackberry whiskey, mojito marmalade, strawberry butter and pod pasties. 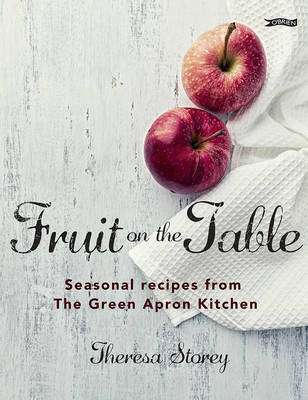 With over one hundred easy-to-follow delicious recipes, and tips for growing, preserving and drying fruit, this beautiful book shows you how to bring fruit to all dining occasions, all year round. The Green Apron is an artisan preserve company run by Theresa Storey, and is based on a small farm in Ballingarry, Co. Limerick. They produce a range of jams, marmalades, chutneys, ketchups, sauces, herb mixes, butters, mustards and pickles using secret family recipes. Born in Detroit and raised in Co. Clare, Theresa Storey now lives in rural Co. Limerick, where she puts her botany degree to good use growing fruit and vegetables and managing the family orchards, gardens and woodland. She uses the fruit of her labour to make fabulous preserves for The Green Apron, which has won many national and international food awards. She also teaches sustainable living and tries to keep up with her three kids. This is her first book.